RetroTurbo.com is an authorized re-seller of EcuMaster EMU. The EMU Black is a class-leading, stand-alone engine management system, designed to operate the most advanced and complex engines available. It is a successor of our proven system, EMU. Throughout EMU’s lifetime we collected lots of data that allows us to substantially improve the device hardware and software. EMU Black targets race cars, road cars, motorcycles, boats, and stationary engine applications. The EMU Black controls fueling, ignition and auxiliary systems on 1-12 cylinder engines including those with drive-by-wire throttles and VVT. It can drive up to 6 passive or 12 smart coils directly and does not require external amplifier/power modules to achieve this. Sophisticated drive-by-wire strategies provide a wide range of throttle control along with advanced plausibility (fault/error) checking for safety. 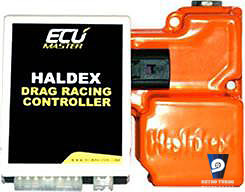 The EMU Black features more built-in value than any other aftermarket ECU. It easily matches the functionality of other stand-alone management systems with multiple inputs and outputs. 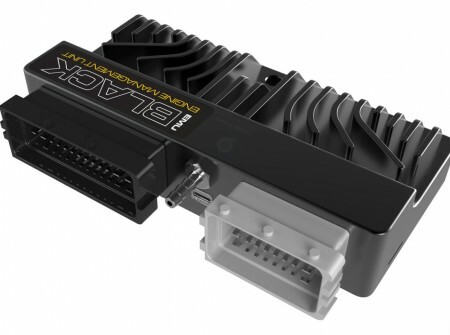 Unlike many other ECU systems, the EMU Black has built-in wideband lambda input (Bosch LSU 4.2, and LSU 4.9 sensors wire directly in), MAP control connector (4 bar MAP sensor on board), 2 EGT probe inputs and an input to directly connect a Flex Fuel ethanol content sensor. All of this provides greater flexibility, reduces costs and negates the requirement for external or supplemental signal conditioning control systems and the associated wiring that other management systems require. The EMU Black is assembled according to IPC-S-815A standards to ensure high reliability of the product. The device is manufactured on an automated assembly line with optical inspection, automatically tested including burn-in. The PCB board quality and design, special surface coating and IP65 enclosure keeps the device operational in the harshest environments. 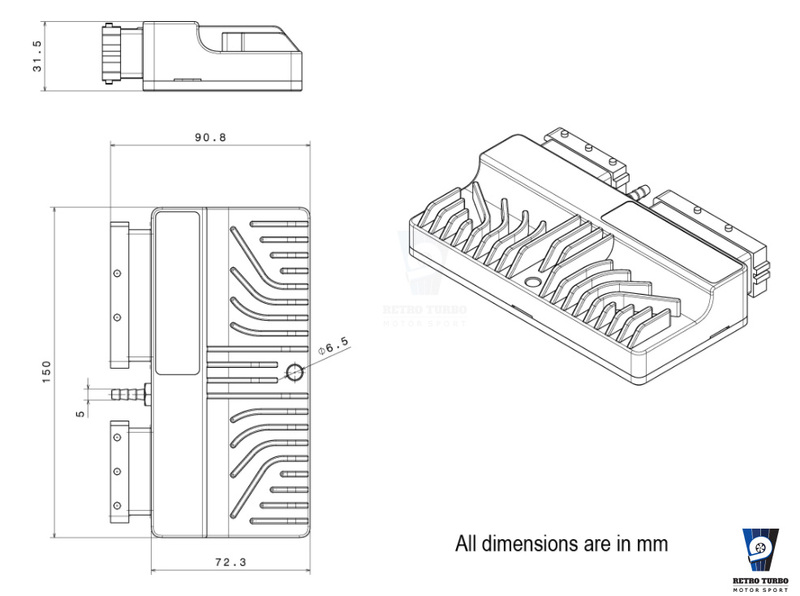 The components used allow continued operation in a very wide temperature range (AECQ-100 GRADE 2 (-40 to +105˚C). EMU BLACK bespoke enclosure is made from CNC machined aluminium. The enclosure design guarantee high immunity to mechanical damage, water resist (IP65) and very good heat conduction from electronic components. Additional hole through the enclosure provides mounting point. At the front of the enclosure there is a micro usb sealed connector for PC communication and MAP sensor connection tube. EMU BLACK utilize 4 layers PCB board and most of components are SMD type (except connectors) and coated with special surface protecting the board and components from moist. Due to design, the device is extremely immune to the vibration. Device is assembled according to IPC-S-815A standards on fully automated assembly line with optical inspection to ensure highest possible quality. EMU BLACK has has two additional analogues inputs in comparison to regular EMU. In addition to this each analogue input has software selectable pullup / pulldown (4700Ohm). For CLT and IAT inputs the pullup resistor is 2200Ohm and could be disabled via software. 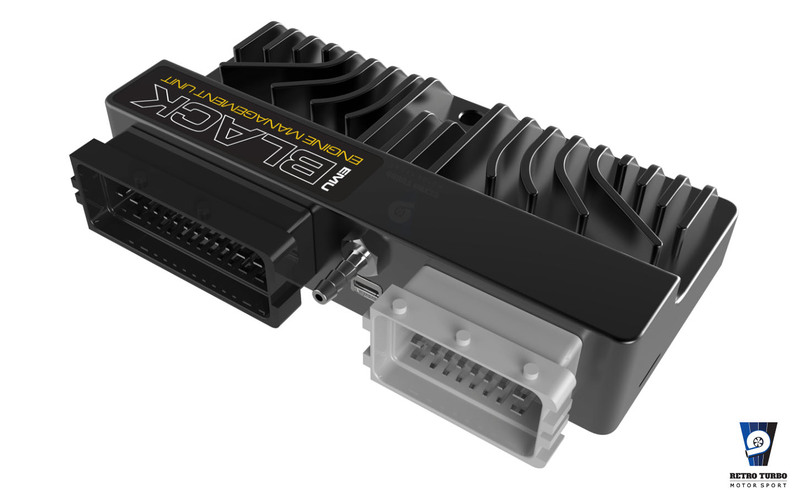 That allows easy sharing temperature signals with OEM ECU when connected in parallel. EMU BLACK introduces 3 digital switch inputs that could be used for activating strategies by switching input to the sensor ground. The input circuit for trigger inputs was redesigned. For each trigger input (Primary trigger, CAM#1, CAM#2 and VSS) pullup / pulldown could be selected (4700Ohm, 1000Ohm, 820Ohm) as well as analogue filter level (none, low, medium hall). Primary trigger input could be HALL or VR (software selectable). For VR sensor the adaptive level could be changed (low, high). For VSS sensor VR or HALL sensor type could be selected. EMU BLACK introduces separate input for Flex Fuel sensor ( regular EMU uses CAM#2 or VSS input for this purpose). Ignition output circuit was redesigned especially the driver of active coils. EMU BLACK supports active and passive coils (software selectable). In comparison to regular EMU it is possible to drive 2 active coils from one ignition output. In addition to this when active coils are selected for connected passive coils no damage occurs. Due to high current capability of built in H-BRIDGE, EMU BLACK is able to control directly electronic throttle (no external module required). Moreover the control strategy was improved (two times higher update rate, defined PWM frequency from 1000Hz to 8000Hz) to allow higher precision of throttle control. For safety reason the DBW strategy works on 2 separate processors and any malfunctioning in one of them causes throttle limp mode. All AUX outputs of EMU BLACK have built in fly-back circuit for precise control of solenoids (in regular EMU external diodes are required for PWM controlled solenoids). Wideband oxygen sensor circuit was redesigned to support LSU 4.2 and LSU 4.9 Bosch sensors. EMU BLACK has built in CAN bus support (as well as separate serial communication) with software selectable 120Ohm terminator. Regular EMU use the same internal voltage regulator for internal circuits and external sensors (+5V output). EMU BLACK introduces addition +5V regulator for 5V output. In addition to this there are two +5V output terminals for easier harness design. 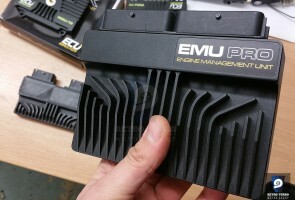 EMU BLACK has new power scheme. The +12V is provided by fixed 12V input (it is used for powering the device and flyback circuit). The switched +12V is used to turn on and off the device. EMU BLACK introduces 3 separate sensor ground terminals to allow easier harness design. EMU BLACK uses 2 connectors (black and gray). 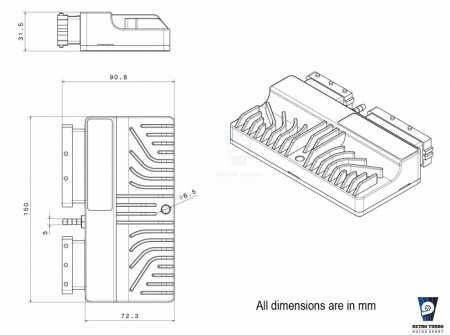 The gray connector (24 ways) has the same pin layout as regular EMU. The black connector is replaced by 39 ways one. Due to smart pin layout it is very easy to repin regular EMU black connector to the new one. EMU BLACK software is improved over the regular EMU. The configuration tree has now additional hierarchy level what makes navigation easier. - Product not to be sold to USA, please contact www.ecumasterusa.com if you are from North America. SKU: ecumasterBLACK. Category: Ecumaster EMU, Engine Management Systems.